Knowing how to make good stock can make all the difference to a number of recipes – soups and risottos especially. Many supermarkets now sell ready made stock in jars in the fridge, but, while they can be better than stock cubes, they can also be overly salty and artificial tasting. Ready made stock is also terribly expensive compared with making your own, especially if you need a decent quantity. Stock cubes have got better in recent years, with modern variations available such as Italian stock cubes and vegetarian options. However, you can’t help but ask yourself what has gone into the stock cube when you see a small block of power – it hardly looks home made! Mastering how to make your own stock is actually really simple. All it takes is plenty of water, some decent ingredients and enough time to turn it into something wonderful. 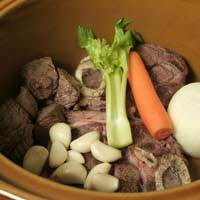 A really cost effective way to make chicken stock is to use the carcass from a roast dinner. In fact, buying a whole chicken (free range, ideally) can feed a family of four for at least three meals, with a stock made from the carcass for a soup or delicious risotto. So, if you have a chicken carcass, start by putting it in a large saucepan with a well fitting lid and covering it with cold water. If you do not have chicken carcass (and wish to make chicken stock) then you can use any chicken bones, or a couple of portions of chicken, such as legs, thighs and wings. The more chicken pieces you add, the more flavourful the stock will be, but also the more expensive. As long as you have a good few bones, a little meat and plenty of time, it will be delicious. Take off as much skin as possible to stop your stock being too fatty. Add a roughly chopped onion (some people leave the skin on and just chop it into quarters, but you may prefer to be a little more refined), a couple of roughly chopped carrots and any other vegetables you have lying around that may have seen better days. Fold a bay leaf or two into the water and add five or six black pepper corns. How Do I Make Good Stock? Bring all this up to the boil in a covered saucepan, then allow it to simmer for as long as possible. It is a good idea to skim off any scum that floats to the top, although you can do this at the end if you prefer. It is also possible to do this in a slow cooker, rather than on the hob. Ideally, you need to leave your stock simmering for a couple of hours to get the maximum flavour from the chicken bones. A really good stock has a well rounded, chicken flavour that only comes from using good quality chicken bones. Be aware that if you are using a roasted chicken carcass the finished stock will be less clear than one made with raw chicken pieces – this will probably only be a concern if you are using the stock as the star ingredient in a consommé. While you are simmering the stock your kitchen will be filled with lovely smells – delicious if you are hungry! You can now take out all the bits and pieces from your stock and either hard boil it down to concentrate or use it as it is. This stock freezes really well, too. If you are going to drain your stock over a colander, make sure you have a clean saucepan underneath – seeing your carefully made stock go down the kitchen plughole is rather distressing! For convenience, freeze stock in an ice cube tray.